It’s odd that I should be writing about snow on such a sunny day, but maybe it won’t be long before England once again is carpeted in the wonderful stuff; here’s hoping. I have been thinking about thinking and memory. Specifically whether we can ‘think’ without language. Yes. Language; the all pervasive tool that envelops us and and defines us. We use it to attempt to make sense of the world and control and define everything. But, like trying to grasp Plato’s shadows, we always seem to fail. We live in an age of effervescent text and gaudy image, instantly and endlessly communicating to each other through ever more complex and competing technologies; it’s hard to think that we will be heard, let alone understood. The capacity for misunderstandings seem endless to me. A hundred or a hundred and fifty years ago, most only knew of their town or village. News from other continents was slow or non existent. People lived and married and worked with people they knew and did mostly what they were expected to do. Were they more content? Now we are presented with such plethora and choice. The problem is what do we choose? Maybe all of this new world is fakery, like Baudrillard’s ‘simulacra’; an endless watery stream of consciousness pretending to be reality. The written words are released from our keyboards to be stored in some faceless mainframe we will never see. But can it be forever? Perhaps in twenty years our children will laugh at our obsessions; “You actually used an IPad?” – who can conceive what wonders they will obsess about? You must wonder where I am going with all of this. Well like most of my writing I don’t know until I get there, just like life. But at the end of the day I know that memories fade and fall, to be replaced by new ones. The language we use continues to fail us, and yet we still try to communicate and connect, over and over. 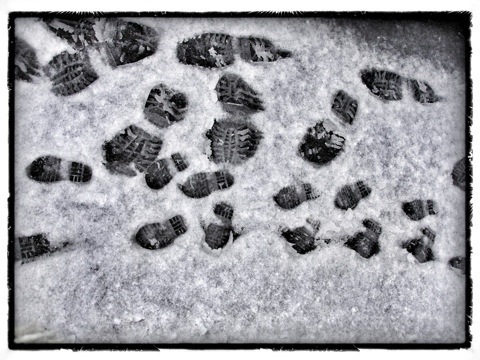 Like footprints in the snow, our writing, communications, thoughts, memories and feelings will fade. But wasn’t it glorious to tread there even for a fleeting moment? What do you think? Well your blog shows that your writing shows great promise. I look forward to reading your stories over the weekend. I wish you all the best of luck for the future and I look forward to watching you grow as a writer. I think that you should put a “subscribe to” button somewhere on this page so I can get email notifications of your recent postings because I think this post was truly awesome and your writing is brilliant. I love this.. it is true. I have been involved in the online revolution before it was even an uprising. The father of my children and I fell in love online, across the continent and all because of AOL. The support system and social structure in 140 characters or less is amazing to behold!